Think Like a CCG or Deck Builder? Found on Flickr, user wgunther. Some rights reserved. I know that I said that I would hold off until Mondays and Thursdays in my prior post, but some of the traffic makes me want to give people more of a reason to visit in the early days of this site. A lot of strategy comparisons - some of them by me - have put this game up against collectable card games like Magic and others. The collectable nature of the game, as well as the combat system, helps to drive those comparisons. While those games can absolutely inform the decisions that we make in this young game, there's something else that's at least as important to consider with Dice Mastesr: Its similarities to deck building games like Dominion, Ascension, and all the rest. And this makes sense. 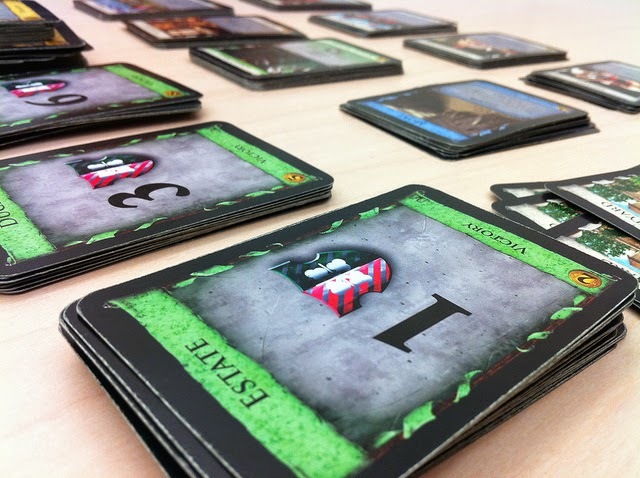 After all, Quarriors, the predecessor to Dice Masters, was a deck builder that sought to replace cards with dice. Many of the non-combat choices are similar to those types of games. I don't think any of this is earth shattering, but it could lead the way for future observations and it provides a helpful framework for examining the mechanisms. Let's have a look. For those who are unaware, the mana curve is the term used in games like Magic to describe the visual representation of cards that cost different amount of mana. The theory is that you want the most low-cost cards and the least high cost cards, because you can only put out one additional resource card per turn and without low-cost cards, you'd be defenseless. It is certainly important in Dice Masters to select cards of differing costs. We pretty well covered that in this article. But resources are handled quite differently in this game. You're always going to have them, and unless you shoot yourself in the foot by not buying any character dice, you'll be able to afford new dice. The difference here is the speedin which you can buy dice, especially those of a higher cost. Cost distribution in this game has to be looked at the way that it is in deck building games. Since every player starts out with the same basic resources - eight sidekick dice, the fundamental question is: What can you buy now that gives you the most options later? The answer is pretty clear. You need to start out with the cheaper dice that provide you with more energy options (low-cost dice, like the always-a-great-example Ghost Rider and Super-Rare Black Widow) or dice that provide you with more efficiency (Gearing Up, Beast). Conventional wisdom already says to start with the two- and three-cost options, but the whyis the important facet here. To some, it's because they're used to thinking about the "mana curve" from Magic - but the mana curve is used because resources are limited each turn and cheap creatures leave you without a defense. In Dice Masters, the true underlying reasons is because these inexpensive dice give you the means to buy everything else down the road. One important mechanism in deck building games is the ability to flush out cards that are no longer important to your strategy. This is most effectively used on the starting resources, which often become obsolete rather quickly. In our case, this is the sidekicks. These resources quickly become useless to us as they can offer, at most, one energy for us to spend. Thinning the herd is important, because it lets us draw the dice that we want more often. This game has no means of "culling" dice as in Quarriors or banishing them as in Ascension. The best we can do in this case is get them on the field. If nothing else, they become last-ditch blockers. They become a bonus die to roll if KO'd. Whatever use you find for them, their most important function at this point is that they are not in your bag. In most CCGs, the most resources that you can get out in a turn are limited, and usually limited to just one. Drawing extra cards is helpful because it gets you closer to the card you need, but that's it. In deck building games, drawing more cards gets you a lot. More resources, more buys, more actions. The same goes for Dice Masters. The more dice you can roll in a turn, the better. This gives you more resources and perhaps the ability to make a big play. This also means that there are times when you want your characters to get knocked out. Perhaps their ability triggers when fielded. Perhaps you just want the shot at rolling multiple energy. Either way, extra draws are key to big turns. In a collectable card game, the vast majority of your cards are there to fulfill the purpose of the deck. Some cards are included as a mitigation strategy, but for the most part the deck is a cohesive whole. You are also confined to that deck, and a card that you don't need is impacting the odds of you getting a cards that you do. This is not true in deckbuilding games. There are certain cards that you may never choose to purchase because the situation doesn't call for it. There are other cards that you only purchase because you've recognized a strategy that your opponent is employing and want to disrupt it. Regardless of the reason, the end result of this - the cards aren't taking up space in your deck unless you absolutely need them, and you are seeing the cards that you need at that point more often. The same thing is true in Dice Masters. As I and others have pointed out before, you're rarely using all eight of your characters in a standard match. This means that team building doesn't only take place when selecting the cards to fill out your squad - it also occurs on a smaller scale in every game as you decide which characters to buy and how many of them to buy. It will also occur slightly differently in every game depending on the opportunities that you see and the strategies that your opponent will employ. These are all great observations. I've never played a deck or dice building game before but I was a very avid Magic player years ago and can definitely identify with the CCG player mentality. I like that this game does rely more on strategy as a particular match develops instead of just strategy up-front on the deck composition. I come from the opposite end in that I am an avid Dominion player, but have no CCG experience. So I figured out the deck-thinning aspects pretty well, but have to learn the whole attack/defense aspect more. Its no wonder I run a team who's abilities do damage (human torch, BW) and not a big attacking team.